June 15th is the first day that college coaches are permitted by the NCAA to contact rising junior prospects directly. For Michigan head coach John Beilein, it’s also the first day that he will extend scholarship offers to class of 2015 prospects. June 15th has been an eventful day in the past, notably two years ago when Mark Donnal and Austin Hatch pulled the trigger for the Wolverines on the same day. This year, like last year when the Wolverines extended just two offers, isn’t likely to feature as many fireworks (a commitment would be very surprising) but it will shed light on the Wolverine staff’s priorities. After the jump we run down Michigan’s 2015 recruiting board and try to break Michigan targets into tiers from expected offers on down. Slam dunk top-30 prospects that have visited Michigan and shown mutual interest. Luke Kennard: Kennard is a slam dunk offer. John Beilein has been tracking him for over two years and there’s high mutual interest. Kennard had a big spring, helping King James qualify for the Peach Jam, and John Beilein or an assistant was in attendance to watch him throughout the April evaluation period. That being said, a June 15th commitment would be a shock. Kennard will stick to his process and has heavy interest from Ohio State, North Carolina and others. Jalen Coleman: Coleman missed out on Michigan’s camp because of the aftermath of his high school transfer but he did visit Ann Arbor last fall. That trip should meet the visit criteria for an offer but he’s in no hurry to make a decision. Coleman, the top 2015 player in the state of Indiana, has major interest from Illinois, Indiana,,Michigan, Michigan State, Notre Dame, Ohio State and Purdue among others. Diamond Stone: Stone also visited Michigan unofficially last fall and the top-10 prospect seems like a shoe in for a scholarship offer as one of the top big men in the country. One complication with a potential June 15th offer, Stone is currently in Uruguay at FIBA Americas with USA’s U16 squad where he’s averaging 15 points and eight rebounds per game. Top Michigan priorities with strong mutual interest that have yet to visit Ann Arbor. Likely offers when they do. Sedrick Barefield: Barefield is near the top of Michigan’s point guard list but hasn’t made the trip east to see Ann Arbor. When he does, it seems like an offer could be waiting for the California guard. Barefield shows a good skillset on video but reviews were somewhat mixed of his performance at the Nike Elite 100 camp in St. Louis. Among point guard targets on Michigan’s board, Barefield probably has the highest combination of mutual interest. Jalen Brunson: Brunson, recently ranked in the top-25 by ESPN, has had the biggest spring of any of Michigan’s ‘15 point guard targets. John Beilein and his staff have seen him plenty on the Nike EYBL circuit and he seems to have genuine interest. He hopes to visit Michigan soon but until he does there won’t be an offer available. Dwayne Bacon: A versatile lefty regarded as a top-30 prospect by most scouting services, Bacon has been in contact with Michigan’s coaches since last summer. Bacari Alexander is the lead recruiter for Bacon and his AAU teammate Corey Sanders. Bacon had hoped to visit for camp but is more likely to make the trip to Ann Arbor this fall for a football game. Corey Sanders: There are questions as to whether Sanders is a true point guard but he has a great handle and is easily the best athlete among Michigan’s point guard targets. Expect Michigan to track Bacon and Sanders in July and try to get the duo on campus this fall. Stephen Zimmerman: Zimmerman is a top 10 prospect and versatile big man, he’s a great fit and arguably the top prospect on Michigan’s recruiting board in terms of ability. However, he hasn’t made the trip to Ann Arbor – something he hopes to do. Elijah Thomas: Another top ten big man, Thomas is hoping to start to formulate a list after June 15th when coaches start reaching out to him. He hasn’t taken many visits but expect Michigan to be calling him on June 15th as he’s already been in touch with the Wolverines. High-interest prospects that either need to be evaluated or show additional mutual interest before an offer. Eric Davis: Davis has had a big summer and visited Michigan for a couple games during the season. Would he be a candidate for an offer? Potentially but he told us in May that Bacari Alexander was talking about a potential offer during his junior year. He’s set on playing the point guard at the next level but his current game screams off guard. Hyron Edwards: Edwards has been solid this spring but his stock has fallen a bit from last summer when he picked up Indiana and Purdue offers. Does Michigan offer now? It seems more likely the Wolverines will watch him in July before making a decision. Noah Dickerson: Big man visited Ann Arbor for College Practice Camp and played well, expect Michigan to track his progress at the Peach Jam in July. 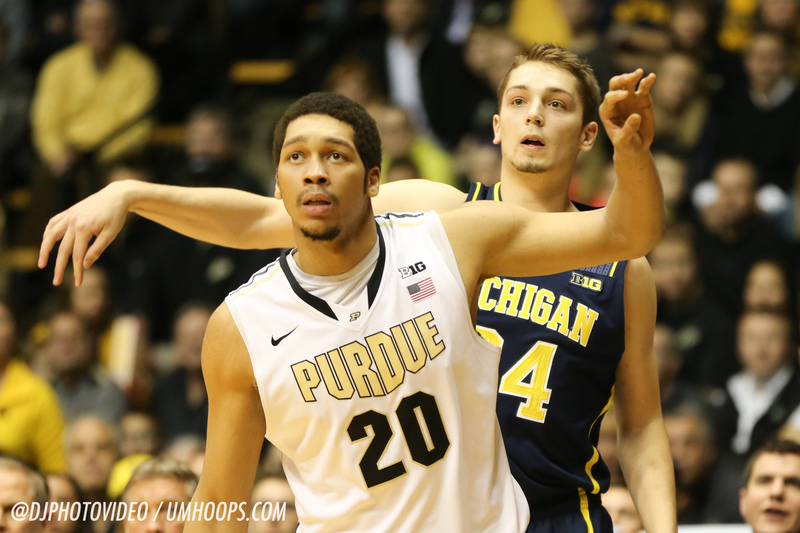 Evan Boudreaux: A do-everything forward, Boudreaux played well in front of John Beilein in Akron this spring. He visited Purdue on Thursday and already holds two Big Ten offers. Expect Michigan to keep an eye on the Illinois native in July. AJ Turner: Turner was a candidate for a summer offer in the class of 2014. His switch to the class of 2015 doesn’t elevate him to that offer status yet but it provides an extra year of development to potentially reach that level. Isaiah Briscoe: Briscoe is a 5-star guard prospect that reports heavy interest from the Michigan staff. That being said, the interest seems to be in the early phases as Michigan is just getting involved in his recruitment. Trevor Manuel: Manuel has visited Ann Arbor but seems more set on heading out of state. His talent is obvious but there doesn’t seem to be enough mutual interest at this juncture.